PORT MORESBY:Opposition Leader Don Pomb Polye has urged his fellow MPs and intending candidates for 2017 General Election to respect the electoral laws. Mr Polye made the call on learning that the Electoral Commissioner Pautilias Gamato had warned against early campaigns until writs were issued next year. 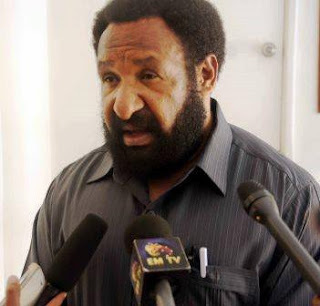 “Time and time again the rule of law and our other laws have been undermined by those in power.Their scars are still fresh but with our intending candidates and most of my fellow MPs in the government, conducting early campaigns only makes the law and order situation worse in the country,” a concerned Polye said. He has joined Huon Gulf MP Ross Seymour’s call on the respective provincial election steering committees nationwide to track early campaigners and bar them from contesting the seats. “It is illegal to run early campaigns.Let us wait for our people to judge our performance in 2017 when the writs are issued and not now,” he said. Mr Polye has also raised concerns on the erosion of the country’s democracy. He said the country’s democracy had been overlooked continuously at the floor of Parliament in this term of Parliament. He cited the ‘sabotaging’ of the Opposition’s 2016 Budget reply and motion of no-confidence vote among others. “With most government MPsand intending candidates luring our voters through their early campaigns also undermines the principles of democracy which hold the fabric of our society intact. “If these trends continue, I am afraid our country is on the verge of kleptocracy,” he said. He said when the alternative government was in government, it would review the electoral laws to address fundamental issues. “One of the issues is we will ensure dummy candidates to split votes of genuine ones will be blocked. Otherwise, he or she will be required to compile signed list of minimum of 1000 loyal supporters. “We will also avoid those with questionable characters to contest elections,”he said. He said other issues the alternative government would address were party hopping, compulsory Opposition with a minimum of 35 MPs, eligibility of political parties and parliamentary committee among others.